dhamma musings: How Far Is It To India? The full story of Buddhist pilgrimage to India is still to be told, although I have made some contribution to it in my books Navel of the Earth: The History and Significance of Bodh Gaya and Middle land Middle Way: A Pilgrim’s Guide to the Buddha's India. I’m always on the lookout for information that all to the story and the other day I stumbled across another fragment in a rather unexpected place – a book about Japanese Buddhism, Robert E. Morrell’s Kamakura Buddhism. Apparently in 1202 the Japanese monk Myoe Shonin (1173-1232) decided to undertake a pilgrimage to India. As part of his preparations for this seemingly impossibly difficult undertaking he tried to calculate the distance involved and the time it would take if he set out from Ch’ang-an, the Chinese capital. The calculations are to be found in Dainihon shiryo VII, pp. 427-8, apparently in his own handwriting. ‘I am unable to contain my affection and longing for India, the land where the Buddha was born, and so I have drawn up plans for the journey thither. Oh, how I wish I were there! If I walked 7 long ri a day, I could reach India in 1,130 days, arriving on the 20th day of the second month of the fourth year of my travels. And if I walked 5 ri a day, I could at long last arrive on the 10th day of the sixth month of the fifth year, a total of 1,600 days’. Myoe was not making a complete stab in the dark, he had carefully studied Fa-hien and Huien Tsiang accounts of their pilgrimages to India and had at least some idea of what was involved. Nevertheless, his calculations were highly unrealistic and as it happened he never even set out on this would-be journey. But what determination, what faith, what courage these pilgrim monks of old had! What an inspiration they were. 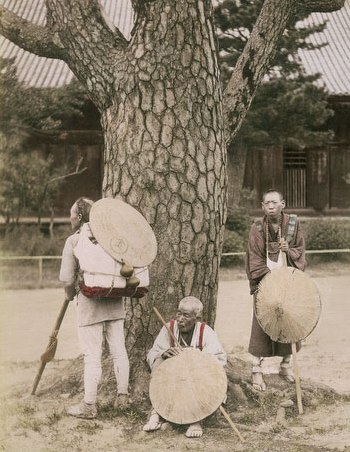 The picture is of Japanese pilgrims in the 19th century. What an inspirational story of the could-have-been first Japanese monk pilgrim. It makes a good story for retelling. Interestingly, he wasn’t the (nearly) first. In 866 Prince Takaoka, who had become a monk, set out for India from Canton. He was never seen again. He is thought to have died somewhere in what is now Vietnam.